Jog Falls, Asia's Largest Water fall. 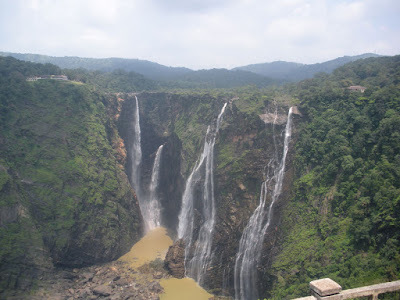 A road trip to Jog falls was just awesome on last Saturday (19-Sep-09). Kevin Finally Found His Lost Brother and Started to Take Pictures of Him. Ya that's it, Saw Jog falls and astonished by it's beauty. So if you haven't seen Jog Falls Then I feel You are missing something in Life.... You gotta go and See it once... The beauty is just awesome. 1. It's Free and open source so no piracy. 2. Installation is easy, You just need to have some patience to read the instructions. 3. There are NO Viruses, so there is NO need to install Antivirus so NO TENSION (At least when plugging my friends Pen Drive). 4. You can do almost anything with Linux which Windows can do. 6. You can find almost all the equivalent windows software free of cost for Linux. 7. Open Office is also Included in the CD. 1. The GUI is not completely matured, You have a Kind of unfinished look for GUI in some places. 2. You get all free software, But installing them can be a bit of pain. 4. You at least need to be a small time geek to be able to use Terminal. 5. Some settings can confuse you if you just migrated from Windows. 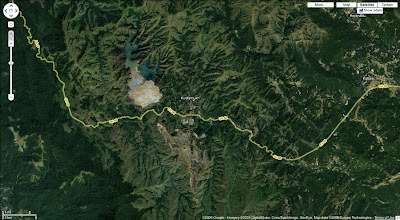 Again I was Browsing through the Google Maps and Saw This..... !!! !